Flight, The Last Paladin Series is an Urban Fantasy story set in two worlds, present day Florida and an alternate world named Irlendria. Sentenced to death for his Bloodright, Startüm Ironwolf has fought for life since the time of his birth. Born a half-breed and a Paladin of Ukko, he is the first of his kind. When his Father’s people, the Klavikians, are destroyed in an overwhelming surprise attack by invading Toenellian Demonic Hordes, Startüm is spirited away to Earth by his Grandsire, Leader of the Shadowfang Pack. Hiding among Humans, Startüm lives in the shadows as he grows and learns to control his powers. On the eve of his eighteenth birthday, the fates of both worlds become irrevocably entwined when the Tuonellians discover Startüm on Earth. Suddenly, Mankind is swept into the middle of a millennium long conflict spanning two worlds and Startüm must find a way to fight his people’s ancient enemy. If not, Humanity will suffer the same fate as the Klavikians. This is an urban fantasy book based on Startüm Ironwolf (what a name! ), who is a special type of supernatural being - a half werewolf/half Klavikian. At this point of my review I'd briefly write about the story and just explain the general gist of what happens but having just finished the book I'm still scratching my head wondering what actually happened. I don't mean that in a totally critical way but the pace of the book was....wow. It was like sitting in a roller coaster. From the first word to the last, the story flew by. Normally I appreciate a fast paced novel but not at the detriment of the story or characterisation - which sadly, was the case with this book on both accounts. I would have liked to have some breathing moments, places in the book where I could settle back down and absorb what I've just read and not hurtle down another bend. However, due to the frantic pace of the plot I just couldn't get a feel any of the characters and in the end I was indifferent as to whether any of them died or not. The story also suffered in that I couldn't get a clear picture in my mind of what was happening or where the story was going. 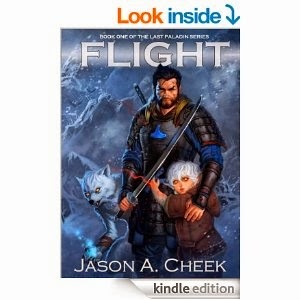 As I mentioned before, this is in a urban fantasy and Jason Cheek does well in creating new supernatural beings and not just writing about the standard stock, but there was a lot of fantasy jargon thrown into such a small amount of pages that it ended up confusing me. From reading the blurb I wanted to learn more about what a Klavikians was, what makes them unique, what are their special traits, but if you asked me now who they are, I'd struggle to form an answer other than they sound vaguely like Klingons. This is an self-pub book and it does show more clearly than many of the more recent indie novels I've read. There was quite a few typos. Nothing too inimical but it did get a little annoying after the fifth misplaced/misspelt word here or there. A thorough re-editing would catch most if not all of them. Okay, I think I've exhausted all the problems I've had with the book, now I'll talk about the positives. The opening chapter was really well written and grabbed my interest immediately. It was one of the better openings I've read this year that I can think of. Other than the typos I can't fault Jason Cheek writing. It was crisp, action-packed and fuelled with adrenaline. There's clear evidence illustrating Cheek's talent at writing, it just needs to be refined a bit more. I can't help but feel that there's an exciting story hidden in this book that just needs the brakes applied to it in order to unearth it. This is a book that I can see will appeal more to teenagers (minus the blood, gore and violence), more specifically male teenagers who enjoy reading comics. In fact if Flight was made into a comic book then I feel it'd be perfect. Startüm in many ways reminded me of comic book heroes in their unflinching sense of justice and almost omnipotent powers.